Click here to view and download PDFs of our worship bulletins, posted weekly as soon as details are finalized! 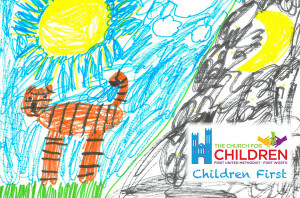 Children First is THIS Sunday at 9:45 am in the sanctuary. Our theme is Creation Care. And one of our most popular guests is coming back — Zooniversity! Come see what animals Allison brings this time. Every Sunday morning, groups of adults meet in FUMCFW Sunday School Classes to enhance their spiritual growth and enjoy fellowship with other Christians. We have classes for a variety of demographic groups, with many different class personalities and styles. Visit the Adult Sunday School page to learn more! 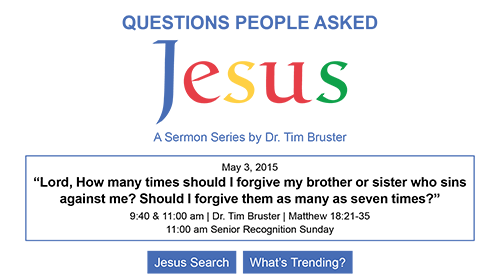 Want to Find a Sunday School class, learn about our library, Television Ministry, Church Archives, Children’s Ministry and more? 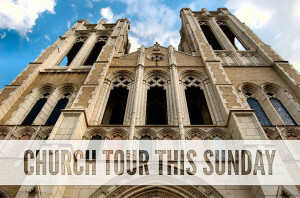 Join the monthly tour of the building this Sunday, May 3, 2015. Meet Deborah Sturdivant at the front of the Sanctuary immediately following the 11:00 am Worship Service. 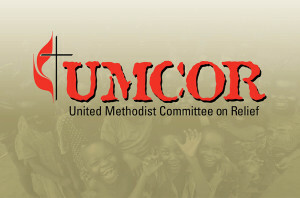 On April 25, just as soon of news of the devastating earthquake that rocked Nepal was heard, UMCOR sprang into action. Because our United Methodist Committee on Relief (UMCOR) has built relationships worldwide, as United Methodists we are always ready to respond to tragedies such as these locally and internationally with immediate help. Click here to learn more. 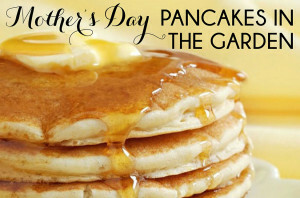 To celebrate Mother’s Day, the men of FUMCFW will serve pancakes in the garden between services. Come enjoy pancakes and family fellowship on this special day of honoring moms and motherhood! Men interested in cooking please contact Sammye Dunn (sammyelou9@gmail.com) or Rev. Chuck Graff (cgraff@myfumc.org) at 817/339-5065. 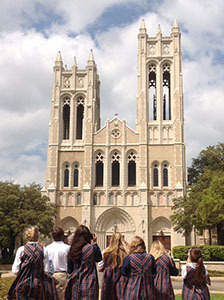 On Monday, April 6, Miss Lauren Cunningham’s art history class from Fort Worth Country Day School visited FUMCFW for a tour of the exterior Gothic Revival architecture and the sanctuary. Sammye Dunn, Lay Ministry Chair, scheduled the tour with Miss Cunningham and Barry Hudson, Building Committee Chair, conducted the tour and shared with the students the history and beauty of our church. 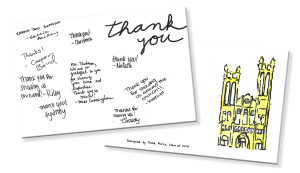 To show their appreciation, both the teacher and class sent thank you’s — the class even designed the card they sent to Barry! Thank you so much for hosting my art history students and me at FUMC on April 6! We thoroughly enjoyed our visit, and the students really appreciated getting to see a Gothic-style building in person. I hope we may visit again next school year! Thanks again for your generosity and hospitality! Have some exciting news about an FUMCFW member that you would like to share? This section of the E-news is the perfect place to do just that! Please send your information to Lisa Helm (lhelm@myfumc.org) and we will include your story! Guests, new members, and all interested in meeting new people and learning more about our denomination, beliefs and our local church ministries, are invited to join us for any or all of these extremely informative sessions. There is no cost for materials or sessions. Leader: Sammye Dunn, Lay Ministry Chair Includes a facility tour and will last until noon. 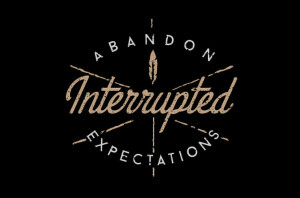 Following the tour, Dr. Tim Bruster will host a complimentary luncheon for all guests and new members. Questions? Contact Rev. Chuck Graff (cgraff@myfumc.org) 817/339-5065 or Dr. Lamar Smith (lsmith@myfumc.org) at 817/339-3886 or please attend beginning Sunday, April 26, in Room 341. 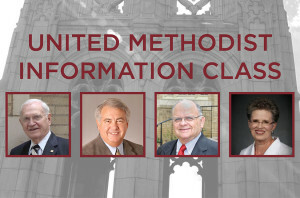 You may also visit the United Methodist Information Class page. 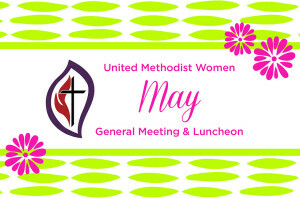 Last UMW meeting of the 2014 – 15 year! Hope you can join us. If you have questions or need more information, please contact Betty Pinkerton (bettypinkerton57@yahoo.com). We look forward to seeing you there! Contact Paula Wagstaff (pwagstaff@myfumc.org) for childcare reservations. Join us for a day of golf at the FUMCFW Golf Tournament, an annual tradition initiated 15 years ago by Mr. Ed Petrushka. The tournament is a Florida Scramble and open to everyone — men, women and guests! 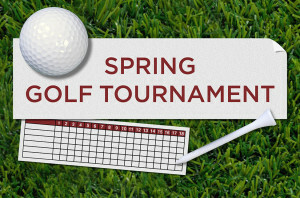 To register please contact Tournament Director, Wayne Maddox (waymad@juno.com) at 817/560-7323 or Rev. Chuck Graff (cgraff@myfumc.org) at 817/339-5065. Please include your handicap, or probable score, person(s) you would like to be teamed with, or your preferred foursome, or we will be glad to assign you to a team. 5.16 FUMCFW Senior Ministries Day In Granbury! Spend the day in the historical city of Granbury where there’s a wide array of activities from historical museums and public park lands, to beautiful wineries and fabulous shopping! 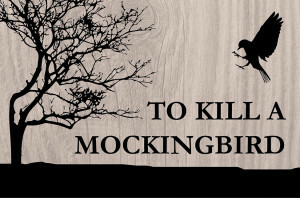 Then enjoy the Granbury Opera House’s production of To Kill A Mockingbird. Built in 1886, The Granbury Opera House is in the National Register of Historic Places in Texas. It was restored and reopened in 1975, and it currently hosts Broadway productions under the name of the Texas Star Theatre. Reservations are due by May 1, and can be made by contacting Gayle Ammerman (gammerman@myfumc.org) at 817/339-5091. Checks payable to FUMCFW. Questions? Contact Rev. Phyllis McDougal (pmcdougal@myfumc.org) at 817/339-5082. Visit the Adult Ministries page for more information on programs and activities. 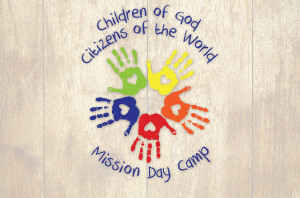 Children of God, Citizens of the World: A Mission Day Camp for Kids combines a strong mission and outreach core with the kinds of activities that make summer camp so much fun. Activities include swimming (registered life guards on site), mission projects, Bible study, music, camp games, Journey of Faith nature walks, and more. Registration is required and is limited to the first 72 complete registrations. Priority will be given to FUMCFW members. Experience God’s Love in Action! In this mission-focused VBS, kids will learn and live God’s unstoppable love at the G-Force Adventure Park and discover how fueling up on God’s Word will change their lives forever. With tons of movement, action and fun, your child will learn to share God’s great love with the world! Registration will be available for children ages 3 years through those entering 6th grade. 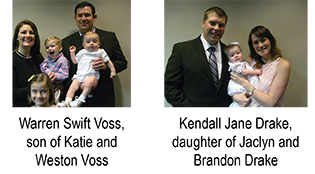 Visit the Children’s Ministry page for more information on programs and activities. 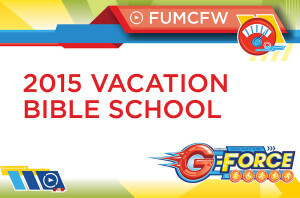 Visit the FUMC Day School page for more information on programs and activities. 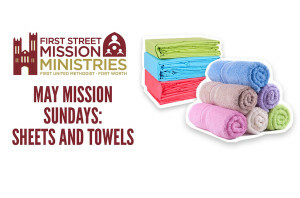 During the month of MAY, please bring sheet and towel sets of all sizes to the First Street Methodist Mission, Monday – Thursday, 9:00 am – 4:00 pm or to the Welcome Center on Sunday Morning. Place your assembled kits in the Welcome Center in the Compassion and Justice Ministries bin, May 3 – June 7. FUMC Fort Worth Compassion & Justice Ministries is collecting assembled health kits for United Methodist Committee on Relief (UMCOR), a United Methodist organization dedicated to alleviating human suffering around the globe — and already responding to the devastating earthquake in Nepal. One way we can help now is to assemble health kits to provide basic necessities to those forced to leave their homes because of war or natural disaster. Click here for instructions for purchasing and assembling these kits. Visit the Compassion & Justice Ministries page for more information on programs and activities. We are all so proud of our Anne S. and Henry B. Paup Sanctuary Pipe Organ and all the ways it continues to surprise and delight us in its versatility and its spectacular sound in our renovated Sanctuary. 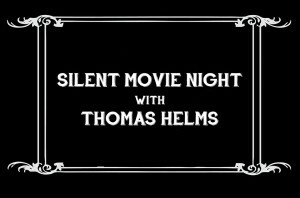 This evening, May 3, is another unique opportunity to show off this magnificent addition to our Music and Worship Arts ministry when renowned theatre organist Tom Helms will perform an impressive live accompaniment to the silent film classic, Safety Last, in our very first FUMCFW Night at the Movies. The evening will begin with an audience sing along, followed by the silent film. Hope to see you there as the celebration continues of our grand new pipe organ. For more information, please contact Peggy Graff (pgraff@myfumc.org) at 817/339-2405. 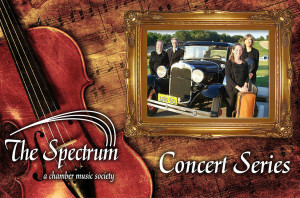 The Spectrum Ensemble, comprised of the finest players from the Fort Worth and Dallas Symphony Orchestras has three performances throughout the year at FUMCFW. For more information, please contact Peggy Graff (pgraff@myfumc.org) at 817/339-2405. Join us for an hour of beautiful music with mezzo-soprano Claire Binek, FUMCFW Children’s Choir Director. 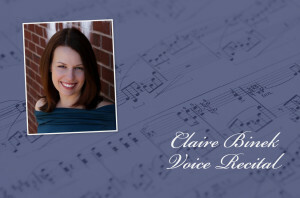 Claire holds a Masters’ degree in Voice Performance from Westminster Choir College in Princeton, New Jersey, and is currently working with new faculty member Professor Molly Fillmore at the University of North Texas. She has performed chamber music and operatic roles in the United States, Austria, and Italy. Supported by Fang-Yi Chu, pianist, an accomplished artist from Taiwan who is finishing her doctoral work in piano performance at the University of North Texas, Ms. Chu plays for many graduate recitals of vocalists and solo instruments at UNT. Claire will present new material for this recital, as well as songs of Schubert, Granados, and Heggie, along with sacred songs and arias. We invite you to come and enjoy this hour of song in Leonard Memorial Chapel. 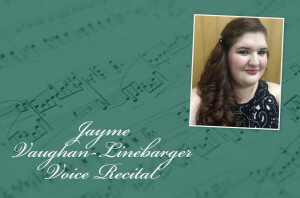 FUMCFW invites you for this evening of diverse and varied music with Jayme Vaughn-Linebarger. A preview of the program she will present to Trinity College London to receive her ATCL diploma, Jayme will be joined by pianist Keith Critcher, as welI as flautist Hayley Eaker and some duets with vocalist Avary Vaughn in a program that will include pieces by Purcell, Mozart, Mendelssohn, Fauré, Copland, and more. Jayme is a senior at Texas Wesleyan University, a member of FUMCFW and a member of both Choral Union and Adoramus. Visit the Music & Worship Arts page for more information on programs and activities. 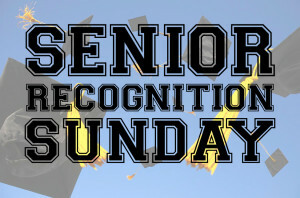 Join us as we recognize and celebrate the graduating seniors of the Class of 2015 during the 11:00 am morning worship service. For more information contact Brenda Kegans (bkegans@myfumc.org) at 817/229-3888. Sign Up Now for the 2015 Summer Mission Trip! Open to all youth grades 7 – 12. Spots are limited with an equal number for middle-school and high-school students until March 1, then it’s first-come, first-serve. We’re working with Center for Student Missions (CSM) and will be doing lots of different types of work with different organizations throughout the city for the week. FUMCFW Youth are headed back to Camp Barnabas this summer for a week of swimming, camping, and playing with amazing campers dealing with mental disabilities. This is an incredible week of life-changing experiences sure to change perspectives, redefine disability, and spread God’s love in an unforgettable way! Questions? Contact Brenda Kegans (bkegans@myfumc.org) at 817/339-3888. Visit the Youth page for more information on programs and activities.